“Brantford is the first municipality in Canada, I say congratulations to them, they did a wonderful thing. I’ll be moving a notice of motion at the June Toronto Council meeting to follow their lead,” in an interview aired Monday evening on Global TV News. Houston Rockets center and seven-time NBA All-Star Yao Ming continued his commitment to wildlife conservation with a visit to San Francisco last month. His visit coincided with WildAid’s first annual Gala on May 5, 2011. 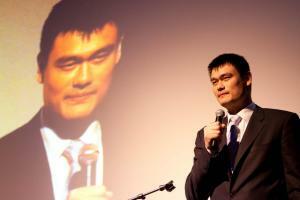 Yao was honored with WildAid’s Ambassador Award. WildAid is promoting their mission to end the illegal wildlife trade through public awareness campaigns with a 20’ x 26’ CBS “Super Screen” strategically positioned at 42nd St. between 7th and 8th Ave. in the heart of the Times Square Plaza.